From left are Arrow’s Tommy Giardino, Shay Runion and Tim Pollard; Florida Pest Management’s Morri and John Sims; and Arrow’s Kevin Burns and Martin Hood. 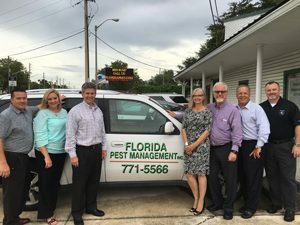 Atlanta-based Arrow Exterminators announces the merger and acquisition of Florida Pest Management Inc., founded in 1983 by John Sims and located in Jacksonville, Fla. This transaction further strengthens Arrow‘s presence in the rapidly growing markets in Northeast Florida and allows it to expand and reach more residential and commercial customers west of the St. Johns River. Florida Pest Management will join the other Arrow Exterminators office in the greater Jacksonville area and will ultimately operate as Nader’s Pest Raiders, an Arrow Exterminators company.